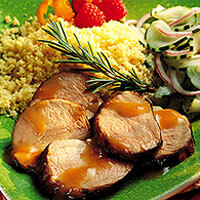 Honey mustard and apricot preserves bring out the underlying sweetness of pork tenderloin. Season tenderloin with salt and pepper; in small bowl stir together the preserves and mustard. Grill pork over a medium-hot fire, brushing with mustard mixture frequently, turning once or twice, until just done, about 15 minutes.